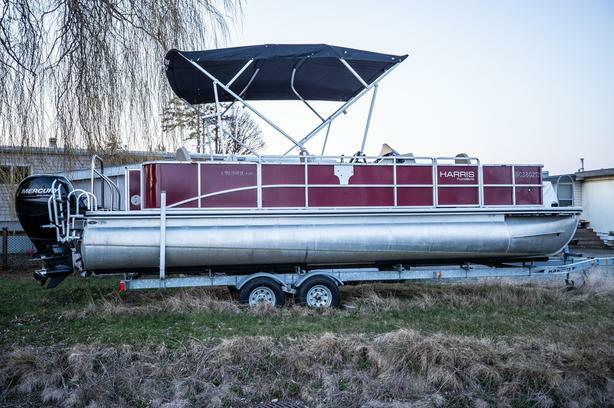 A rare Pontoon model in the Pacific North West not only designed as a fishing platform, also constructed to withstand the Salt Water Environment. Roomy, seating for eight people and two integrated coolers underneath the two bench chairs. Molded cup holders forward as well installed with the two bench seats. A well-appointed aft workstation that conceals a pull-up hidden fold away change room alongside the stern accommodates port-a-potty use or swim wear attire change facility. Accommodation swim ladder set up for outdoor water activity such as water skiing or tubing.